Palestinian children in Gaza on Tuesday rallied near the ruins of al-Katiba building where Luay Kuhail and Amir al-Nimra were killed by Israeli warplanes two days ago. The children called for holding Israeli criminals accountable and asked the international community to intervene and stop the killing of Palestinian children. 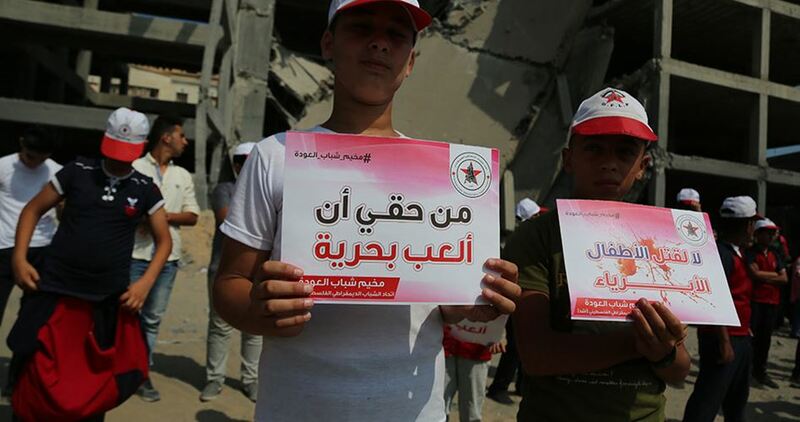 The children taking part in the protest, which was organized by the Palestinian Democratic Youth Union, raised banners underlining their rights to life and play and other banners saying “Palestinian children plant life while the Israeli occupation plants death”. Kuhail and al-Nimra, both aged 15, were killed while they were playing near a public park that was targeted by Israeli warplanes in Gaza city Saturday. A delegation of the Syrian Coalition headed by President Abdurrahman Mustafa toured northern rural Aleppo on Tuesday, visiting the towns of Al-Raie and Al-Bab. In addition to President Mustafa, the delegation included Vice-president Badr Jamous, Secretary General Nazir al-Hakim, Head of the Syrian Negotiations Commission Nasr al-Hariri, and Head of the Syrian Interim Government Jawad Abu Hatab. The delegation met with representatives of the local councils in the area, officials in the chambers of commerce and industry, the police force and the Free Syrian Army groups. The delegation was briefed on the reality of the service institutions in the liberated areas. President Mustafa thanked all officials for the services they are providing for civilians in the liberated areas. He stressed that the Coalition is seeking to strengthen the relationship with everyone in these areas, which comes as part of the presidential plan for the next phase. President Mustafa pointed out that work is underway to open offices of the Coalition in all liberated areas, with the first of these offices to be opened in the town of Al-Raie. Moreover, President Mustafa stressed the need to strengthen the relationship and permanent communication between the Syrian Coalition and all institutions operating in the liberated areas. He pointed out that this will contribute to the development of a comprehensive plan to achieve the objectives of the Syrian revolution, namely freedom and dignity and the toppling of the regime. Nasr Al-Hariri gave on overview of the latest developments in the political process. He stressed that the political solution is the only option to achieve the aspirations of the Syrian people through the implementation of the Geneva Communique of 2012 and UN Security Council resolution 2254. Hariri also underscored the need to pay attention to the situation inside Syria, particularly at level of the Syrian revolution in order to reorganize the ranks and prepare well to meet the challenges ahead. Secretary-General Nazir al-Hakim talked about the role of local councils and other institutions in the administration of the liberated areas. He said that these councils presented a successful model of governance and exposed the incompetence of the Assad regime’s institutions and the extent to which it uses them to serve its autocratic goals. Two Palestinian youths were injured Tuesday in an Israeli airstrike that targeted a group of Palestinian citizens east of Gaza. Local sources reported that an Israeli drone fired at least one missile at a group of Palestinian youths near al-Tuffah neighborhood east of Gaza city. Ambulances transferred the injured youths to the Indonesian Hospital in northern Gaza. Their injuries were described as “minor”. 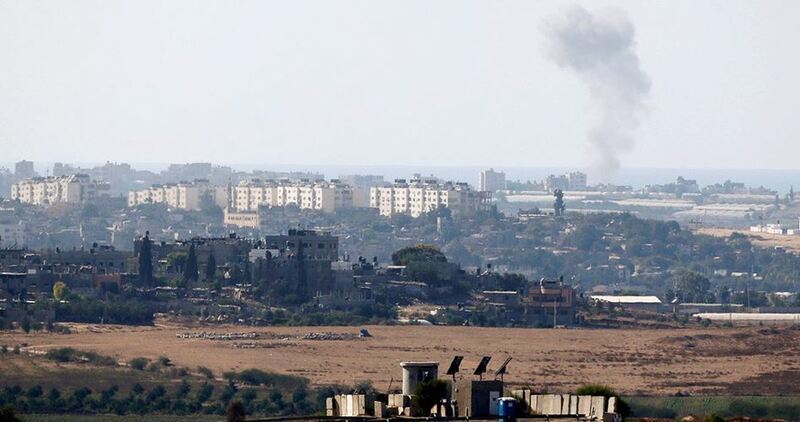 The Israeli occupation army announced that the aerial attack targeted a group of Palestinians who allegedly launched fire balloons toward Israeli settlements adjacent to the Gaza Strip. GAZA, PALESTINOW.COM — Hamas Movement strongly condemned Israel’s decision to close Karam Abu Salem crossing and to reduce the fishing zone for Gazans. Along the same line, the Movement’s pokesperson Hazem Qassem warned Israel of “dangerous consequences” over its fresh restrictions at a commercial crossing with the Gaza Strip. “These vengeful measures reflect the ugliness of Israeli crimes that violate all humanitarian laws and norms,” he said. Such decision will never succeed to break our people’s steadfastness and strong will, Qassem continued. The statements came after Israeli government decided to further limit the flow of goods into the Gaza Strip in response to the burning balloons fired from the coastal enclave. ‘You need to be prepared for the continuation of the fight,’ he told settlers of illegal Jewish settlement near Gaza. Israeli Prime Minister Benjamin Netanyahu said on Monday that “exchange of blows” with Palestinian resistance “is not over yet,” stressing that Israel is “determined to win,” Israeli media reported. “I told them we are in an ongoing fight,” the Israeli news website Ynet News quoted Netanyahu telling reporters during a visit to the illegal Israeli Jewish settlement of Sederot near the Gaza Strip. “Just as we are now completing the thwarting of the tunnels, and just as we acted against and succeeded in stopping the mass charge on the fence [east of Gaza], we have also instructed the IDF to eradicate and stop the incendiary kite and balloon terrorism,” he said. Netanyahu’s remarks were delivered in the wake of the Israeli aggression on Gaza that took place on Saturday: “We delivered the most serious blow Hamas has suffered since Protective Edge”, he said. The Israeli Knesset has passed the first reading of what is called the Facebook Bill which stipulates deleting content from social media, Quds Press reported. The law is to go for its second and third readings in the coming days. The Knesset said in a statement that the bill, when it becomes a law, would authorise the court to issue orders to delete internet content “if it harmed the human safety, public, economic, state or vital infrastructure safety”. According to the statement the law is to include the content of Facebook, Twitter, YouTube and other internet platforms. It would also include search engines like google and it would block certain content from appearing in the search results. Israeli Prime Minister Benjamin Netanyahu said yesterday that the “exchange of blows” with the Palestinian resistance “is not over yet,” stressing that Israel is “determined to win,” Israeli media reported. The Israeli Knesset has passed a bill banning whistleblowing organisation Breaking the Silencefrom attending schools, in a bid to clamp down on critics of the military, with detractors hailing the move as a blow to freedom of speech in the country. 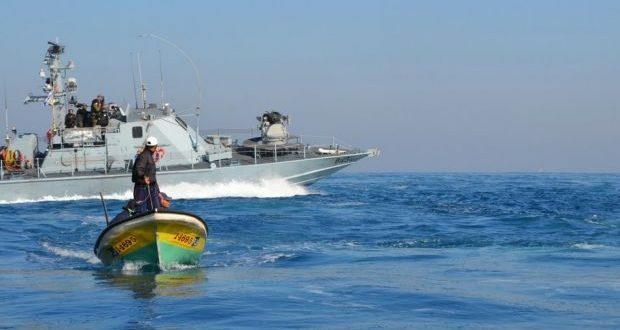 Israeli Occupation Authorities (IOA) this week decided to reduce the fishing zone for Gazans to only three nautical mile starting Tuesday, breaking the 1993 Oslo agreement, which grants them 12 nautical miles in the Mediterranean Sea. In 2006 with the start of the Israeli siege on Gaza, Israel had reduced it to only three miles, and later raised it to six. This week, Israel decided to reduce the fishing zone back to three nautical miles as of Tuesday. The move is a punitive measure for the burning balloons, which have allegedly caused fires in the Gaza enclave settlements. This comes as Israel closes the Kerem Shalom crossing, the only commercial crossing to Gaza. 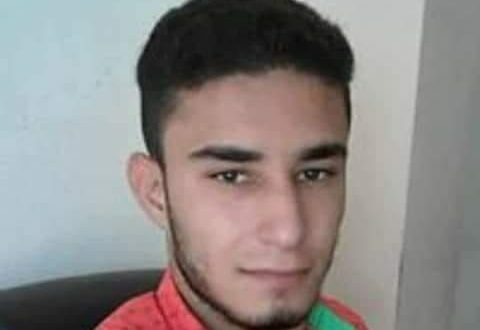 A Palestinian youth on Tuesday has died of wounds he sustained during the March of Return on the borders of Gaza on 14 May, one day ahead of the Palestinian 70th Nakba (catastrophe) day, and the US embassy move from Tel Aviv to Jerusalem. The youth was identified as Sari Al-Shobaki, and his family announced on Facebook that Sari sustained severe injuries two months ago during the protests. The family said that their son was shot in the neck, which lead his to suffer quadriplegia. He was taken to a hospital in Jerusalem for treatment, but was announced dead on Tuesday morning. Since the start of the Return march on 30 March, over 140 people in Gaza have been killed, and over 20,000 wounded.